Jacobson said 130 firefighters from the Durango Fire Protection District, Los Pino Fire Department, Upper Pine Fire Protection Distsrict, Ute Mountain Ute Agency, the Bureau of Land Management, the San Juan National Forest and two Juniper Valley hand crews are on the fire. “They’re hitting it hot and heavy because we expect winds gusting up to 45 mph around 1 o’clock,” Jacobson said. The size of the fire, which began Sunday afternoon, remains at 60 acres, Jacobon said. It is 40 percent contained. The cause of the fire hasn’t been determined. No homes are under pre-evacuation notice and no homes damaged or destoyedk, Jacobson said. Firefighters on Monday halted the spread of the 213 Fire west of Bondad Hill after flames jumped containment lines at midday. 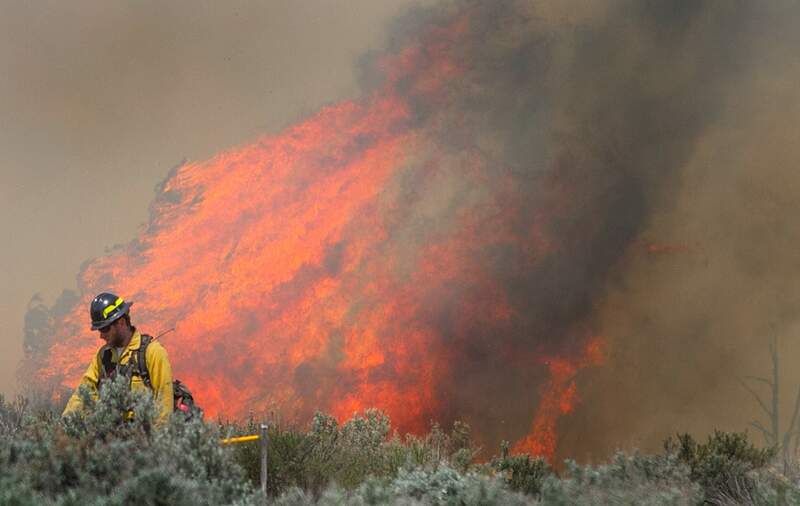 Wind pushed the fire north-northwest around noon, but engine crews were able to stop its spread, said Howard Richards Jr., a forester with the Bureau of Indian Affairs Southern Ute Agency. The Southern Ute Agency is in command of the incident because the fire is on Southern Ute land. Winds were swirling Monday at the fire’s site along the Animas River, he said; the wind died down later in the afternoon, calming the fire activity. “Things are looking better right now,” Richards said. Crews are prepared to be diligent to keep the fire from spreading Tuesday, according to a news release from La Plata County. DFPD crews were stationed at houses near the fire to protect homes in case of flare-ups. The call for structure protection was a preventive move, Hanks said. The 213 Fire – named after the county road near where the fire started – began Sunday afternoon. On Monday, a Durango-based San Juan Hotshots crew with 13 members arrived to fight the fire, as did two 20-person inmate crews from Juniper Valley and Cañon City, Richards said. In addition to the agencies already mentioned, firefighters from the Los Pinos Fire Protection District, Bureau of Land Management and Ute Mountain Ute Agency Fire were at the scene. The fire is being fought on the ground; no aviation resources were assigned to the fire. Officials have not revealed the fire’s cause, saying it’s still under investigation. Shawn Cave, a U.S. Forest Service law-enforcement officer, examined the origin site Monday along the west bank of the Animas River. Small flags on scorched ground showed where the fire started. Cave said he could not discuss his investigation until it’s complete. Most of the fire’s new growth Monday occurred on the river’s east side. The fire jumped the river Sunday evening. No homes have burned, but 24 homeowners were asked to voluntarily leave Sunday afternoon. They were allowed to return Monday under a pre-evacuation notice, and the notice was lifted at 7 p.m. Monday. As a precaution, buses carrying Durango School District 9-R students home Monday along La Posta Road turned back to their respective schools where parents would have to pick them up. The fire was smoldering among cottonwoods on both sides of the Animas River. La Posta Road (County Road 213) is open to traffic, but drivers are asked to drive with caution because of smoke and fire equipment and personnel in the area. Firefighters were using the DFPD’s Station 11 at Bondad as the incident command post. 213 Fire The 213 fire that started off of County Road 213 Sundat afternoon jumped containment lines Monday. The 213 fire that started off of County Road 213 Sundat afternoon jumped containment lines Monday. SHAUN STANLEY/Durango Herald - DURANGO, CO- 4/13/15 - Firefighters monitor flames above the East side of the Animas River Monday of the wildfire that broke out Sunday afternoon along County Road 213 that jumped containment lines Monday. 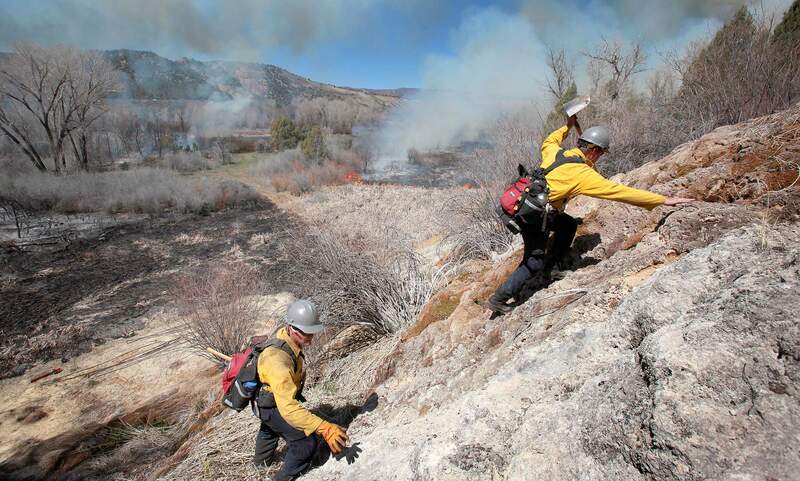 SHAUN STANLEY/Durango Herald - DURANGO, CO- 4/13/15 - Firefighters dig fire lines ahead of flames on the East side of the Animas River Monday from the wildfire that broke out Sunday afternoon along County Road 213 that jumped containment lines Monday. 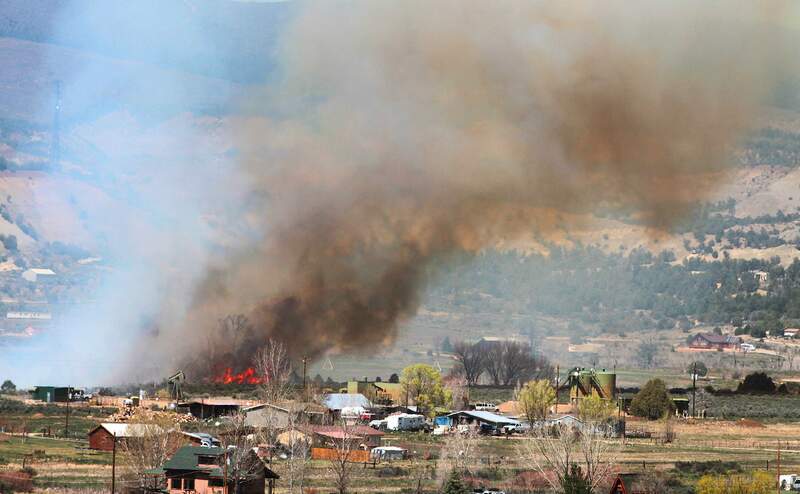 SHAUN STANLEY/Durango Herald - DURANGO, CO- 4/13/15 - Homes and flames are seen in the South Animas River Valley Monday above the East side of the Animas River from the wildfire that broke out Sunday afternoon along County Road 213 that jumped containment lines Monday. 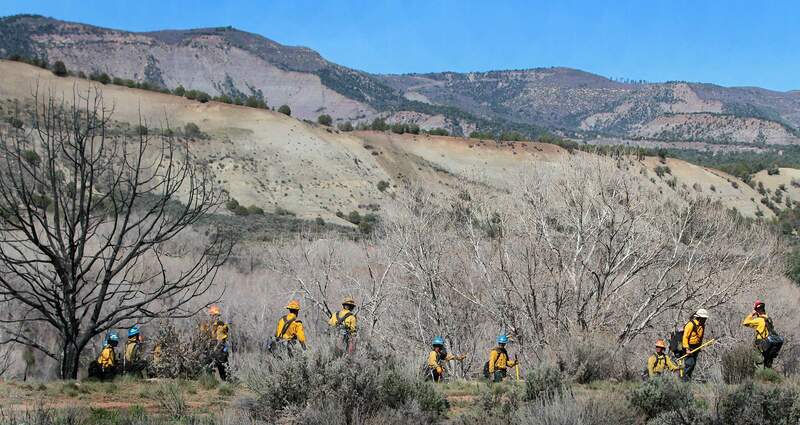 04/12/2015- Durango- A hand crew makes their begins a fire line around an area of the 213 Fire in the Animas River south of Durango near La Posta Road (County Road 213) on Monday afternoon. A multi agency response is fighting the fire that is burning in cotton wood trees and brush. SHAUN STANLEY/Durango Herald - DURANGO, CO- 4/13/15 - Firefighters climb up and away from flames on the East side of the Animas River Monday from the wildfire that broke out Sunday afternoon along County Road 213 that jumped containment lines Monday. SHAUN STANLEY/Durango Herald - DURANGO, CO- 4/13/15 - Smoke plume is seen above the East side of the Animas River Monday of the wildfire that broke out Sunday afternoon along County Road 213 that jumped containment lines Monday. SHAUN STANLEY/Durango Herald - DURANGO, CO- 4/13/15 - Firefighters monitor growing flames above the East side of the Animas River Monday from the wildfire that broke out Sunday afternoon along County Road 213 that jumped containment lines . SHAUN STANLEY/Durango Herald - DURANGO, CO- 4/13/15 - Firefighters walk along County Road 213 this morning in an area that was burned by the wildfire that broke out Sunday afternoon. SHAUN STANLEY/Durango Herald - DURANGO, CO- 4/13/15 - Firefighters carry equipment away from progressing flames on the East side of the Animas River Monday of the wildfire that broke out Sunday afternoon along County Road 213. Holding the line. Firefighters monitor an eastern edge of the the 213 Fire Tuesday morning ahead of expected afternoon winds in the Southern Animas River Valley. #213Fire @DurangoFire and through the La Plata County Office of Emergency Management @LPC_OEM. A wildfire that broke out south of Durango on Sunday, again threatened homes in the Animas River Valley on Monday. The 213 Fire jumped a containment line Monday. Firefighters monitor growing flames above the east side of the Animas River on Monday. An investigation continues looking to find the cause of the blaze. Firefighters climb away from flames on the east side of the Animas River on Monday. The Durango-based San Juan Hotshots crew with 13 members joined the fight Monday, as did two 20-person inmate crews from Juniper Valley and Cañon City.